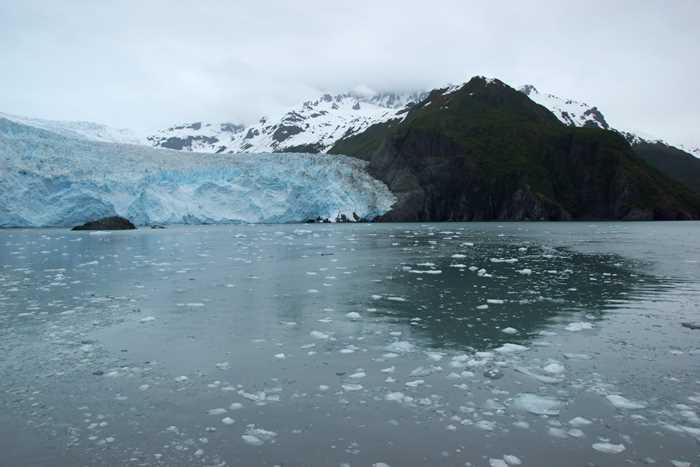 Kenai Fjords National Park is mostly unreachable by car or by foot — with the exception of the Exit Glacier area, just north of Seward. 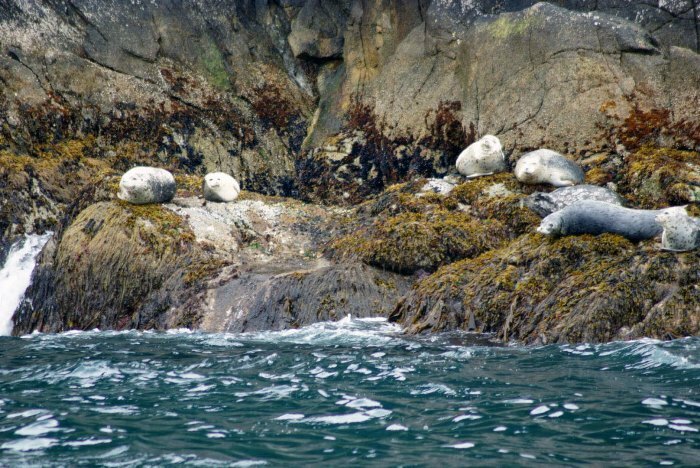 If you want a bigger taste of what this national park has to offer, you need to travel by boat, out of Resurrection Bay, into one or more of the park’s namesake fjords. 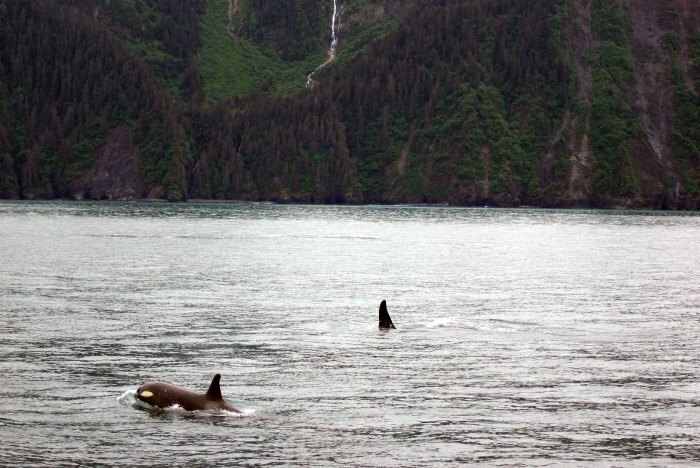 There are plenty of options for scenic cruises out of Seward. 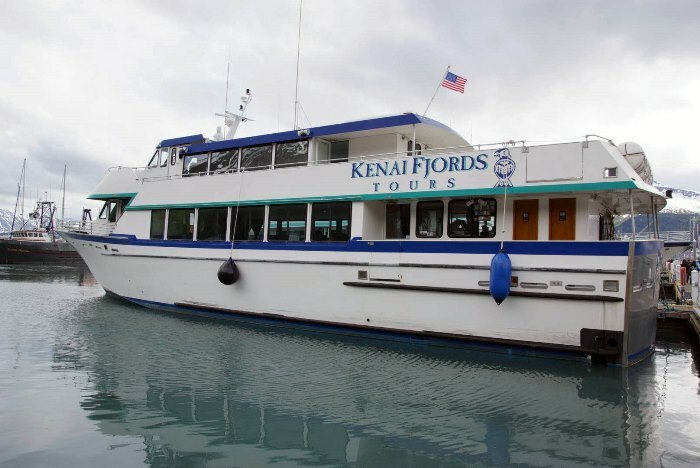 I chose a six-hour voyage aboard Kenai Fjords Tours. 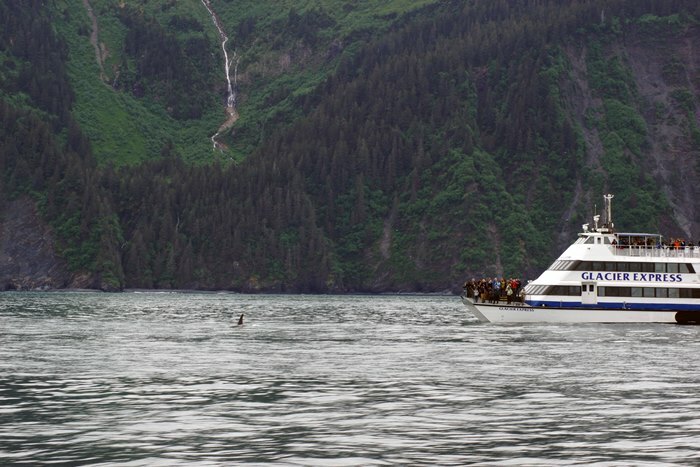 Kenai Fjords boat tours depart from the Seward Marina, which is just north of downtown Seward. Take the Seward Highway (Alaska 9) to Harbor Street, then 4th Avenue. 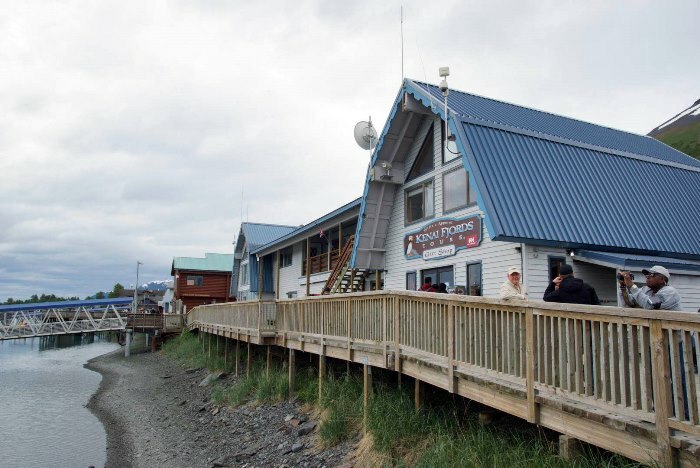 The headquarters for Kenai Fjords Tours is located a short distance north of the Kenai Fjords National Park visitor center. The journey begins here, at the Seward Marina. 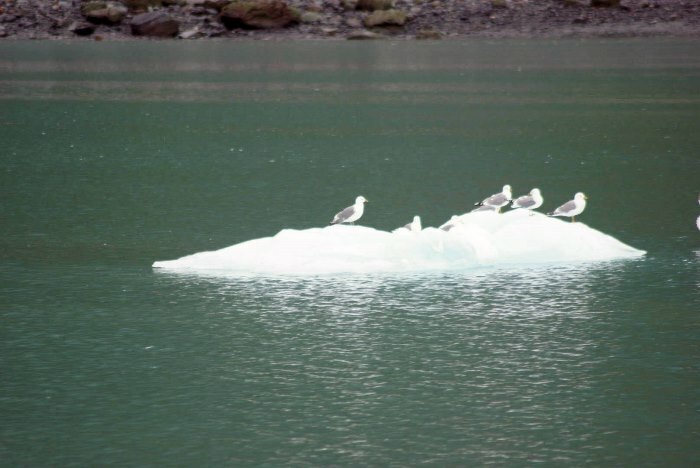 Actually, mine began at my motel, because Kenai Fjords Tours will pick you up and deliver you to the docks. I made my reservation through my motel’s front desk, and supposedly received a small discount. There’s probably a better way to get a slightly better deal, but I wasn’t in the mood to figure it out. My 6-hour tour ended up costing $151. 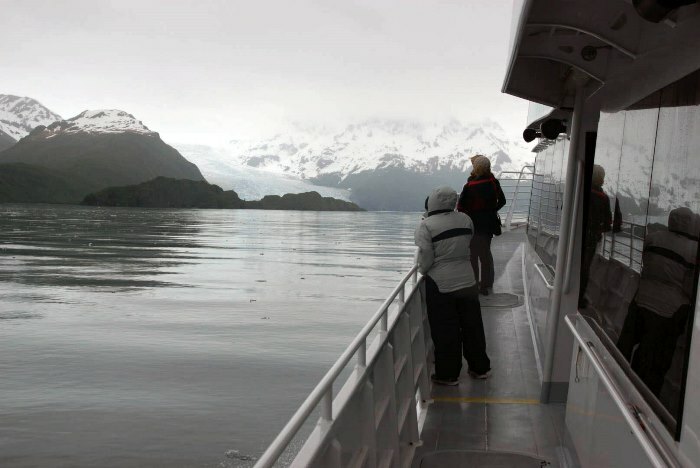 In addition to the six-hour tour, there are longer and shorter cruises available from several companies in Seward. At first, I tried to get aboard an 8.5 hour cruise — which was just a few dollars more, and offered a free prime rib/salmon dinner. Because of the seasickness I experienced, I’m glad the longer tour was sold out. I wouldn’t have been the least bit interested in a big meal. This isn’t my boat, but it’s very similar. Mine was parked on the other side of this one. Both are 95-foot boats that can carry 150 passengers. That seems like a pretty big boat, until you start crashing into 12-foot waves. More on that in a moment. I received permission from the captain to mount two time-lapse cameras aboard the ship — the same ones I use for Drivelapse videos on my car. The one in front was a waterproof Brinno TLC-120, the one in the back was a TLC-200 Pro. 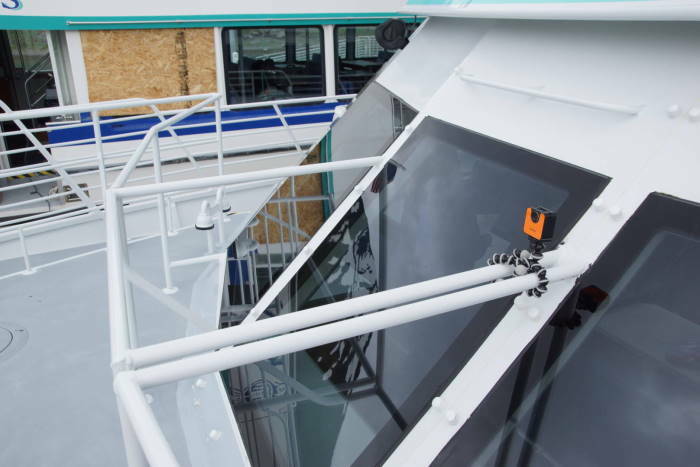 Videos shot by both cameras are at the bottom of the page, allowing you to see the entire voyage. 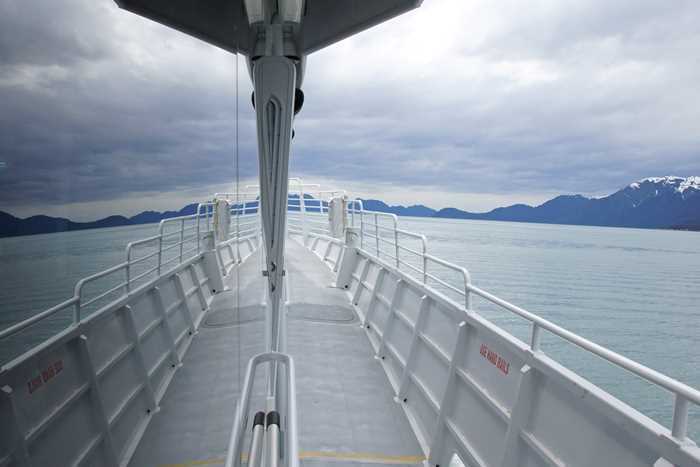 As the boat leaves the marina, it’s smooth sailing through Resurrection Bay. On the way out, we passed this big, somewhat ugly coal tipple. The captain explained that boats from China park themselves under the tipple for several days as they’re filled up with coal, then return home. The start of the cruise was great. Okay, the weather wasn’t fantastic. 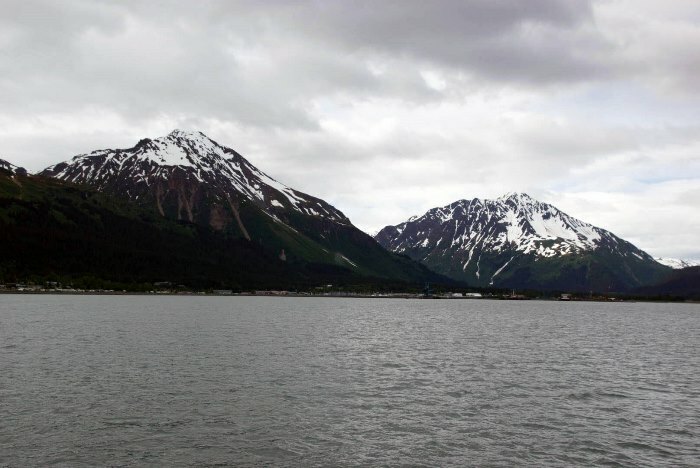 A year earlier, I had decided not to go on a cruise out of Seward because of the cloudy weather. This time, I didn’t let it stop me. And while it’s unfortunate that I didn’t have blue skies, I certainly did get the true Alaska sailing experience. 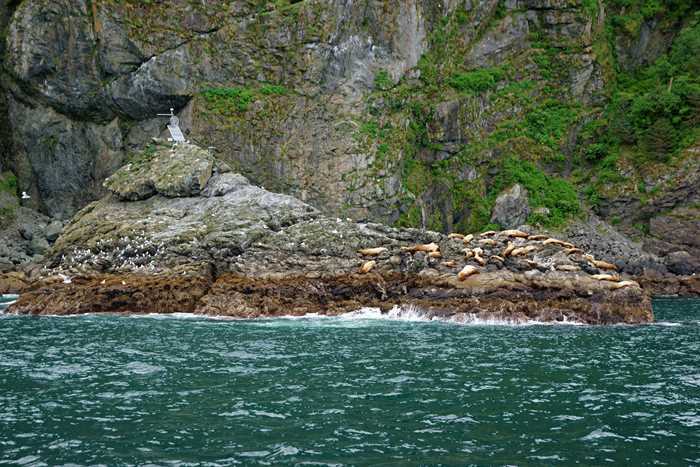 One of the main reasons to take a Kenai Fjords cruise is to watch for wildlife — and we were barely out of port when the sightings began. 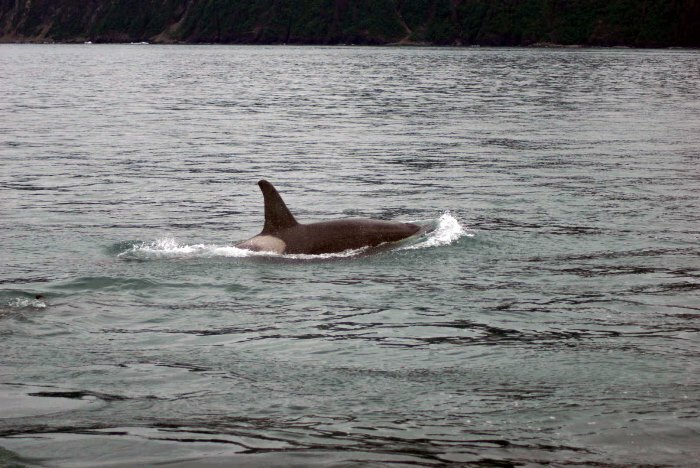 Here you see a couple of killer whales swimming around, just off the starboard side of the boat. I had seen them at Sea World, but this is an entirely different experience. It’s quite remarkable to see them swimming in open waters. Our boat was traveling along with another ship, and we were both watching for wildlife. We would keep an eye on them, to see which way they were looking, pointing, and photographing. I shot this from my seat on the lower deck of the ship. I had taken one Dramamine before leaving port, and I quickly popped another one as the waves kicked up. Despite the pharmaceutical help, I was getting slammed by seasickness. I held still and tried to fix my eyes on something stationary outside, but the boat was bobbing and listing so much, it was almost impossible. Once we rounded the bend, and headed into Aialik Bay, the waters calmed, and I was able to get out of my seat and take pictures once again. 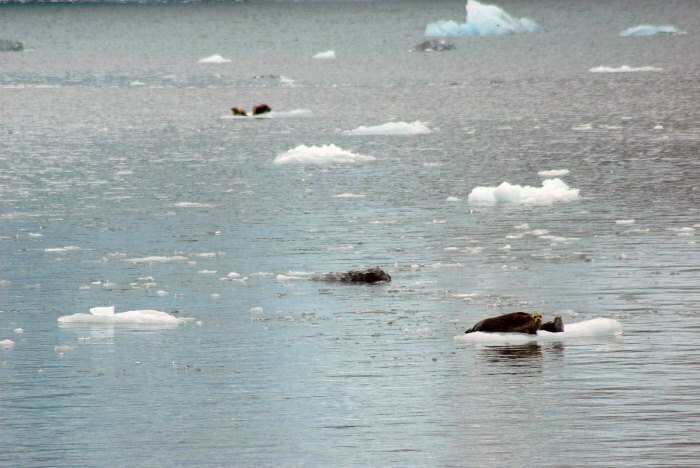 Seals are a common sight on the cruise. This is just one of several places where they were hanging out. 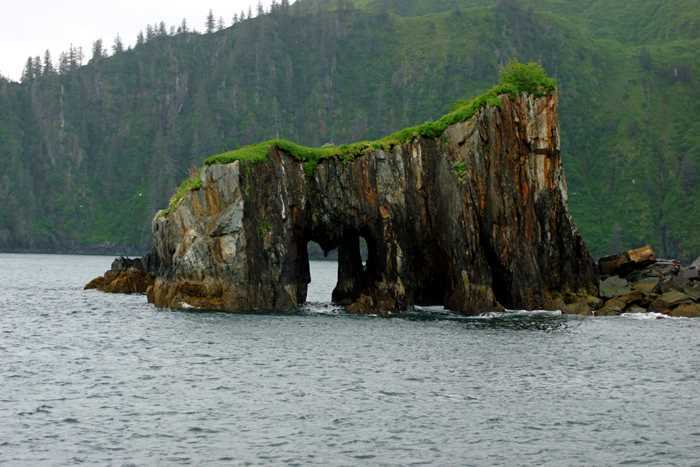 This rocky arch stands at the entrance to Tooth Cove, about halfway up Aialik Bay. The best part of the cruise awaits at the northern end of Aialik Bay. Here, Aialik Glacier meets the water. As we approached, I started hearing clunking noises coming from the hull of the ship. 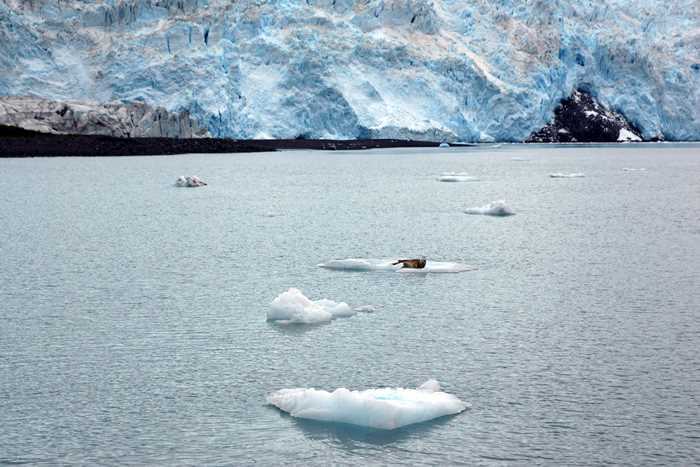 We were plowing through water littered with tiny icebergs that had broken off of Aialik Glacier. 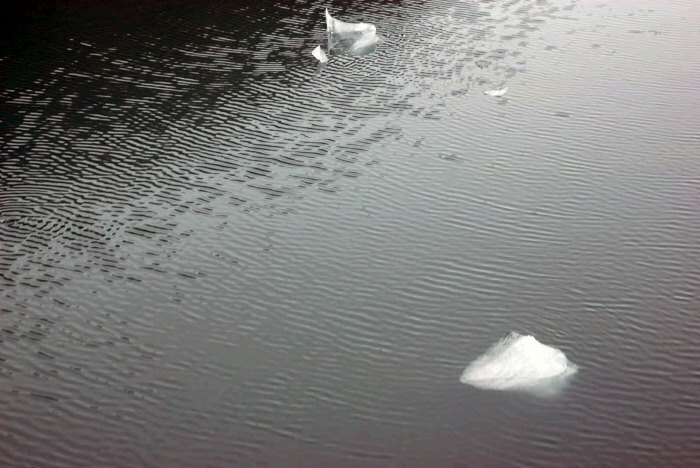 Thankfully, none of them were Titanic-sized, but still, the sound was ominous. I’ve been told that cloudy days are actually best for photographing glaciers, because the reflected light looks even more blue than usual. … and of course, some birds, too. The ship lingered here in these calm waters for quite a while — probably 20 minutes or so. Everyone gathered along the railings to stare out at this icy wonder. 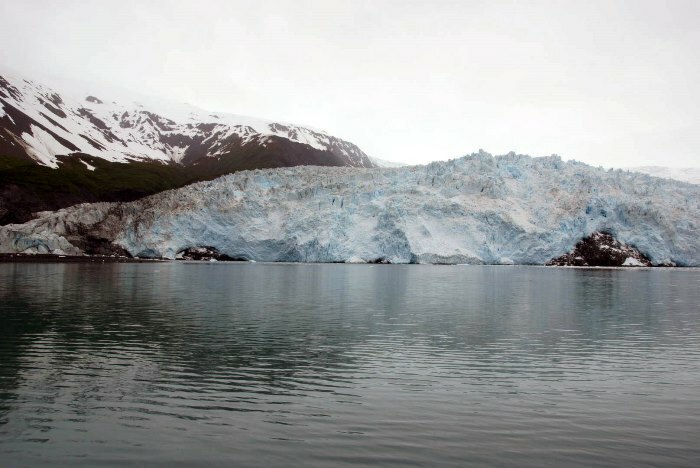 Aialik Glacier is just one of about 40 glaciers that connect to the Harding Icefield — a mind-bogglingly big chunk of ice that covers more than 300 square miles. If you include all of the glaciers that are fed by the icefield, you get a chunk of ice that covers 1,100 square miles — which is just slightly smaller than Rhode Island. 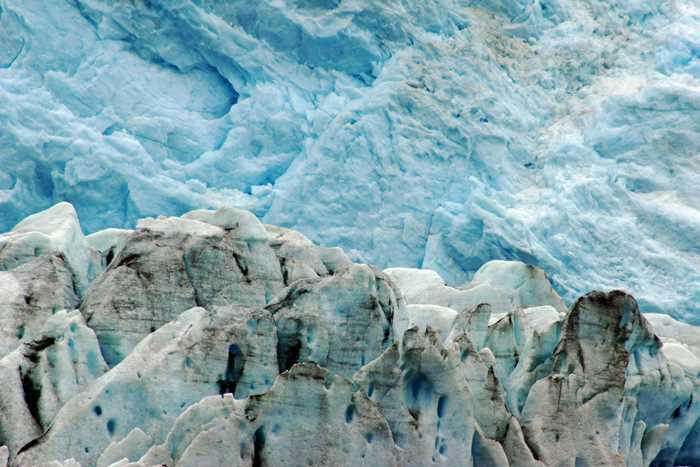 The Harding Icefield is one of four icefields remaining in the U.S., and the largest one completely contained in the country. It receives more than 400 inches of snow every year. Eventually, it was time to head out of Aialik Bay and backtrack to Seward. Before the seas got rough again, I took a few more picture of the brilliant green hillsides that meet up with the shockingly green-blue glacier water. Water from glaciers has this color, thanks to the slow-moving ice grinding the mountains into “rock flour”, which remains suspended in the water for a while. I’m sure all of the mountains surrounding Aialik Bay were impressive, but thanks to the cloudy weather, they were hard to see. 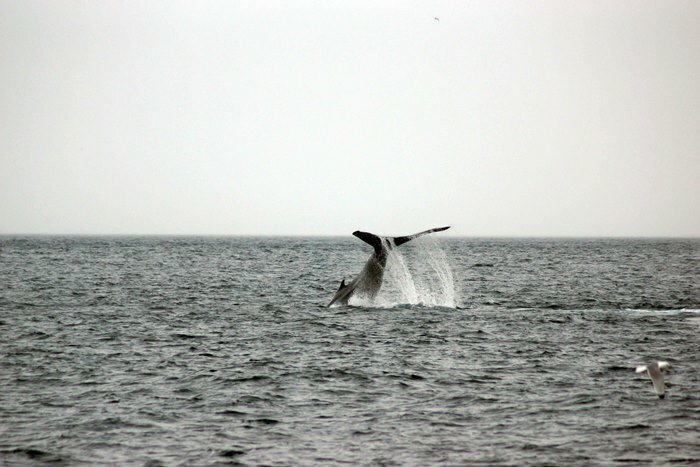 One of our best whale sightings came just before the waves kicked up again. 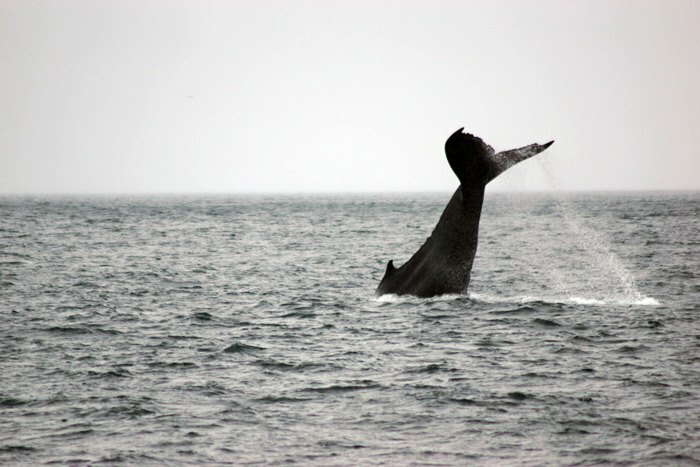 I quickly snapped a few incredible pictures of a whale waving its tail at the boat, before diving below the surface. And then came another hour of 10 to 12-foot seas. I was amazed to watch other people onboard the boat, some of which were suffering as I was, while others talked and enjoyed their time as if nothing unusual was happening. But I’m telling you, what was happening outside that boat looked like a scene from Deadliest Catch. … and a nice place for humans to hang out. 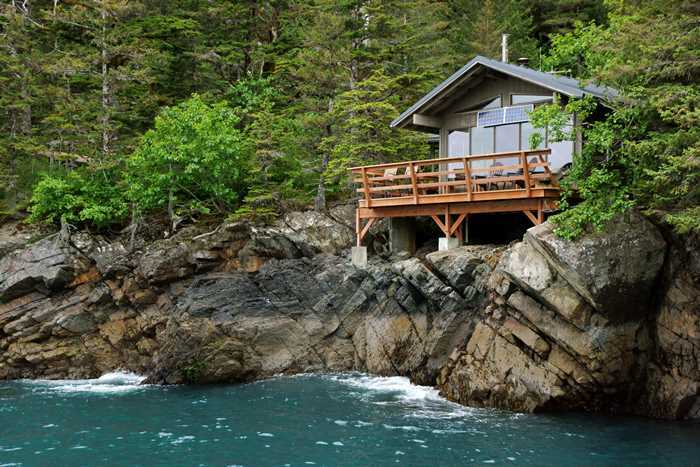 This home is on the northern edge of Thumb Cove. 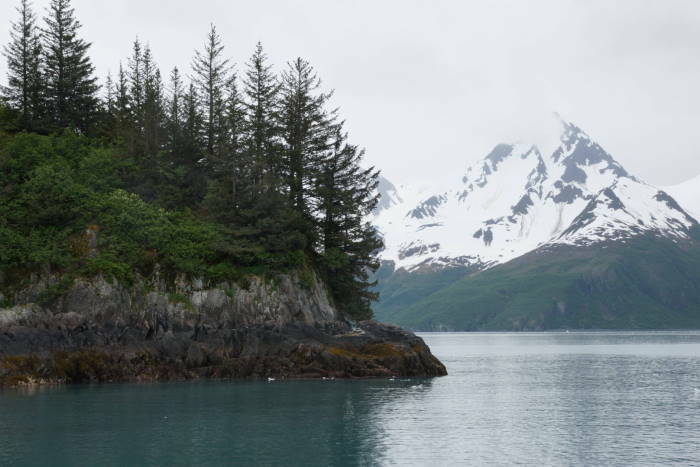 I’d guess that, aside from the occasional boat filled with tourists passing by, it offers all the serenity and beauty that you could ask for in Alaska. 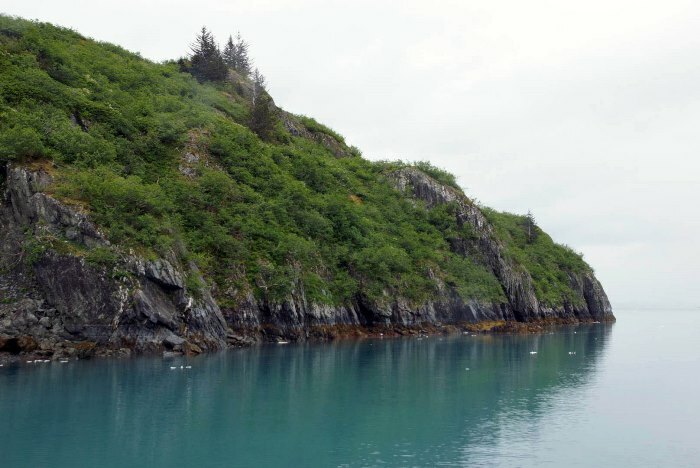 Thumb Cove is directly across from Caines Head — the destination of a popular hike near Seward. Later this day, I hiked a short distance towards Caines Head (stopping at Tonsina Point). 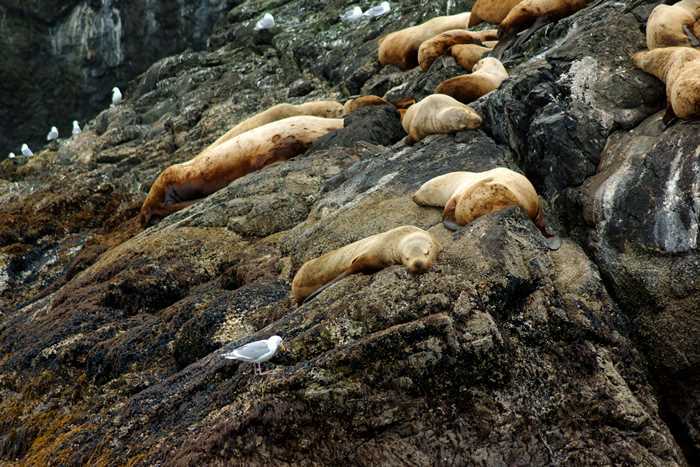 The entire round-trip to Caines Head usually takes two days, because part of the trail (in both directions) must be hiked at low tide. Once you’ve reached Caines Head, you can explore the ruins of an abandoned World War II-era military fort. 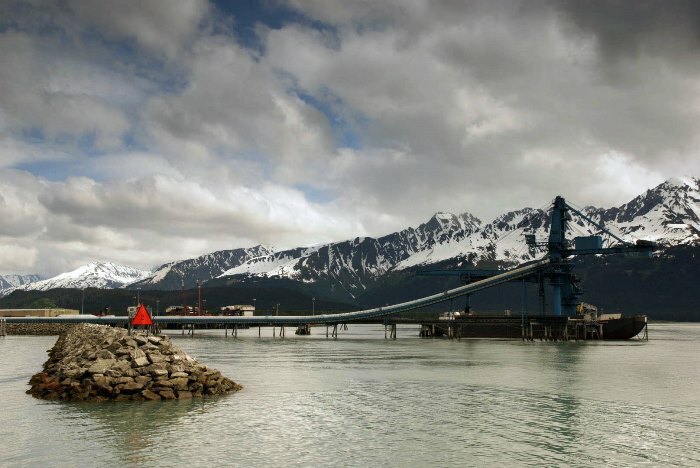 And then, all that remained was the final trip up Resurrection Bay to Seward. 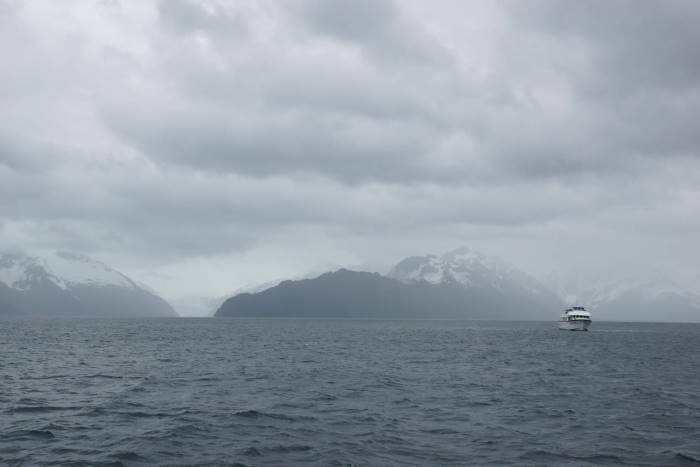 The scenic cruise into Kenai Fjords National Park would be spectacular on a clear day, but it’s still pretty good on a cloudy day. If you are prone to seasickness or motion sickness, you will get sick on this trip, and over-the-counter medication like Dramamine may not be enough to help. If the staff warns you of high seas, take it seriously. If you don’t think it will be a problem, by all means, go ahead and enjoy a day on the water! Remember that the 8.5 hour cruise is only slightly more expensive than the 6-hour cruise, and offers a free meal and a stop on an island.